Sparkling Wine — the Anytime Drink! 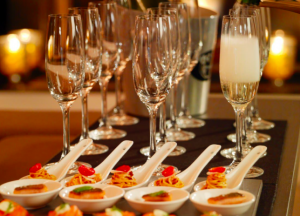 ENJOY SPARKLING WINE — THE ANYTIME DRINK! So when was the last time you drank a glass of bubbly? Was it last New Year’s Eve, after the ball dropped? Was it at your cousin’s wedding, when the best man made a sloppy speech and raised a toast to the bride and groom? If your answer is “Yes,” then you’re missing out on a lot of fun. Here’s why. Sparkling wine is crisp, refreshing and delicious, anytime and anywhere. You don’t have to spend a fortune, and there are plenty of great choices if you know what to look for. Sparkling wine is, quite simply, any wine with bubbles. Champagne is the most famous (and the priciest) of them all, and to be called Champagne it must be made in the Champagne region of France. It will set you back at least $40, but whether it’s dry and citrusy or rich and creamy, Champagne is always tres elegant. You can also get into the bubbly game for a lot less. If the label says “Cremant” or “Cava,” it’s a sparkling wine that’s made in exactly the same method as Champagne, so it’s good quality and delicious, and is priced from $10 to $20. Look for any Cremant de Bourgogne from France or Cristalino Cava from Spain. We make great “Champagne Method” sparklers here in America, too. Look for Gruet in the $15-$20 range (their Brut Rose is awesome) or Domaine Carneros for around $35. You can go Italian with Prosecco, a lighter-bodied bubbly that can be dry (try Zonin or Zardetto) or not-so-dry (LaMarca). If you have a really sweet tooth, you’ll love any Moscato d’Asti. This lightly-effervescent wine from Italy is naturally sweet and tastes like peaches and honey (really!). So when should you drink Sparkling wine? It’s never too early for bubbly. For breakfast or brunch try a Mimosa made with a Cava and orange juice, or move up to Italy’s breakfast drink, a Bellini. Just thaw and then purée a bag of frozen peaches, add a little sugar to taste, and pour in some Prosecco. It’s delish with French Toast! There are lots of before-dinner choices. Try Cremant or a domestic sparkler, straight up and ice cold, and pair it with Crostini topped with Boursin Cheese and Smoked salmon. This aperitif is easy, elegant, lip-smacking good, and a staple in my house. Pretend you’re lounging in an Italian bistro by mixing a “Spritz” with Prosecco and Aperol. This drink is refreshing, not sweet, with hints of bitter orange peel. Add a tray of cheese and nuts and relax till dinner time. Serve Champagne as a salad course wine. Believe it or not, the high acidity makes it a great complement to vinaigrette dressings. And my personal favorite was recommended by a chic and well-dressed French woman. Sip true Champagne with…potato chips! The combination of crisp and dry with salty and greasy is a true gastronomic pleasure. You get the picture — Sparkling wine is versatile, user-friendly and easy to enjoy. 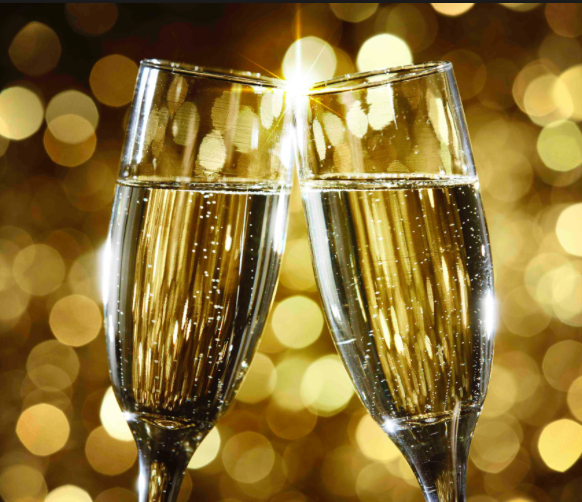 Get out there and explore the world of bubbly, and If you must raise a toast, just grab a Cava! Deb Lapmardo has a long and happy history in the wine business. “Back East” she owned and managed Michael Charles Premier Wine, a fine wine retail shop. Deb also created and managed an online wine store and was sales manager for a fine wine distributorship. Deb has earned her Sommelier certification and specializes in wine education. She also authors thewinecellarsclub.com and was a long time commentator for WFMJ-TV. Now in Arizona she manages WineAdvisers LLC. In her spare time, she and Chuck love to cook great food, believing that the ultimate relaxation is to share good wine and good food with friends and family.